23rd January 2019 is #CumbriaDay! With Cumbria Day just around the corner, we’ve put together a collection of graphics in the lead up to and for Cumbria day itself. We’d love to get #CUMBRIADAY trending on social media and would like to encourage you where possible to share on your own channels. All graphics are available for members to use and share along with us and are accessible below. Our 7-day countdown goes live on social media today and will continue every day in the run up to Cumbria Day. The countdown graphics also include Cumbrian dialect, the #CUMBRIADAY and the date 23.01.19. For social media using the hashtag #CumbriaDay, these can be used on images and an update of profile pictures. 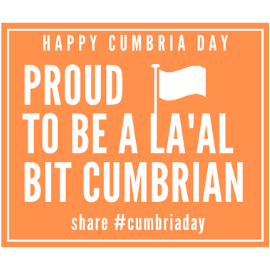 Graphics are available for sharing, ‘Proud to be Cumbrian’, ‘Proud to be a la’al bit Cumbrian’, ‘I’d rather be in Cumbria’ – these will provide the opportunity for locals and visitors to be able to get involved in Cumbria Day and share their ‘Cumbrian’ graphic. We’ve asked friends and family from all over the world to share images of their ‘I’d rather be in Cumbria’ signs, that we plan to post for Cumbria day. We’ll be sharing all of the above across social media channels both consumer and corporate facing and ask that you share our posts on the day, as well as any of your own to improve on the trend. If you’ve got any plans for your businesses on Cumbria day, be sure to let us know and get involved – the more the merrier!